The sun has unleashed a massive solar eruption, but it'snot expected to reach Earth, NASA scientists say. The sun storm was a C3 class flare and erupted from a sunspotknown as sunspot 1105. "Just as sunspot 1105 was turning away from Earth onSept. 8, the active region erupted, producing a solar flare and a fantasticprominence," NASA officials said in a Thursday statement. Sunspotsare temporary dark structures on the surface of the sun. They are caused byintense magnetic activity and sometimes erupt with energetic storms. Class C3 solar flares are powerful, but not strong enoughto do more than create brightauroras when they arrive at Earth. But this flare, while impressive, was aimed away from ourplanet, NASA officials said. "The eruption also hurled a bright coronal massejection into space," they added. "The eruption was not directedtoward any planets." Coronalmass ejections are huge eruptions of plasma and ionized atoms into space. When aimed at Earth, the solar particles stream down the planet's magneticfield lines toward the poles. 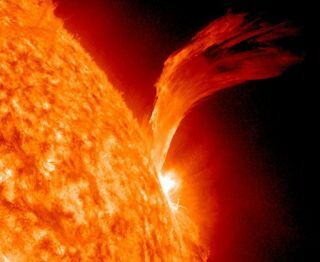 Severe solar flare events can cripple satellitesand have the potential to knock out power grids on Earth. The sun is currently entering an active period of its11-year solarweather cycle after a lull in activity.